Maintaining appropriately low phosphate levels is one of the ongoing struggles that reef aquarists face. Elevated phosphate levels can cause a variety of undesirable effects, including increased green algae growth and decreased growth of calcifying organisms such as corals and coralline algae. There are many ways to help keep phosphate in check. These methods include the growth and export of organisms that take up substantial amounts of phosphate, such as macroalgae (my preference), certain corals, and even bacteria. Other methods include exporting organic materials that contain phosphorus by using skimming, activated carbon, and polymer resins. Finally, many aquarists use materials that directly bind phosphate. Many solid inorganic materials are sold to aquarists to bind phosphate. Most of these have been developed for binding phosphate and other ions in industrial situations, and have been adapted for use in marine aquaria. In a previous article I reviewed the use of certain aluminum-containing materials, and discussed the concerns related to the potential release of aluminum and its impact on corals. Recently, iron-based phosphate binding materials have become popular among reef aquarists. These materials have been used commercially to treat drinking water (to remove arsenic, for example) and to treat wastewater (to remove a wide range of pollutants, including phosphate). They are sold to aquarists under a variety of different brand names, including Phosban, Phosphate Killer, and Rowaphos. This article will describe what they are, how they bind phosphate, what else they may bind, and what other effects they have. I'll also discuss some potential explanations of certain negative effects that a number of aquarists have encountered when using these materials, including the potential bleaching of corals and the precipitation of calcium carbonate. Phosphate: Why worry about it? The "simplest" form of phosphorus in reef aquaria is inorganic orthophosphate (H3PO4, H2PO4-, HPO4--, and PO4--- are all forms of orthophosphate). Orthophosphate is the form of phosphorus that most test kits measure, and is a form that is readily bound by iron oxide hydroxide materials. Orthophosphate is also present in natural seawater, although other forms exist there as well. Its concentration in seawater varies greatly from place to place, and also with depth and with the time of day. Surface waters are greatly depleted of phosphate relative to deeper waters, due to biological activities in the surface waters that sequester phosphate in organisms. Typical ocean surface phosphate concentrations are very low by reefkeeping standards, sometimes as low as 0.005 ppm. Absent specific efforts to minimize the phosphate level, phosphates will typically accumulate and rise in reef aquaria. They are introduced mostly with foods, but can also enter with top-off water and with some methods of calcium and alkalinity supplementation. Phosphate can also be a limiting nutrient for algae growth. If phosphate is allowed to accumulate, algae growth may accelerate and become problematic. At concentrations below about 0.03 ppm, the growth rate of many species of phytoplankton depends on the phosphate concentration (assuming that something else is not limiting growth, such as nitrogen or iron). Above this level, the growth rate of many of the ocean's organisms is independent of phosphate concentration (although this relationship is more complicated in a reef aquarium containing iron and/or nitrogen sources such as nitrate above natural levels). Consequently, deterring algae growth by controlling phosphate requires keeping phosphate levels quite low. For these reasons, phosphate should be kept below 0.03 ppm. Whether keeping it below 0.01 ppm will yield substantial additional benefits (or detriments) remains to be established, but that is a goal that some aquarists are pursuing with various methods of exporting phosphate, including the iron oxide hydroxide materials. Other ways to maintain low levels of phosphate in normal aquaria are to incorporate some combination of phosphate export mechanisms, such as growing and harvesting macroalgae or other rapidly growing organisms, using foods without excessive phosphate, skimming, using limewater, and using other phosphate binding media. Some aquarists have tried to reduce phosphate also by inducing blooms of microorganisms such as bacteria. This last method should, in my opinion, be left to experienced aquarists. What is iron oxide hydroxide? A variety of different materials go by the general description of iron oxide hydroxide. One version is frequently referred to as Granular Ferric Oxide (GFO), and that name will be used throughout this article unless something else specific is intended. Ferric refers to iron in the +3 state, (called iron (III), or Fe+++), which is the most stable state of iron under aerobic conditions. The iron in GFO is ferric. Ferrous refers to iron in the +2 state (called iron (II) or Fe++). It is the more stable salt form of iron under anaerobic conditions. There is no ferrous iron in GFO (except perhaps trace impurities). Iron hydroxide (Fe(OH)3) is composed of an Fe+++ ion surrounded by three hydroxide (OH-) ions. It is readily formed by combing any soluble form of Fe+++ with hydroxide ions. Adding Fe+++ (as in iron sulfate or chloride) directly to seawater will instantly form largely insoluble Fe(OH)3, which appears as a brown mud. This effect is the primary reason not to use unchelated ferric salts as iron supplements in marine aquaria, but that's a story for a different article. At the other end of the extreme of iron (III) oxides and hydroxides is the dehydrated form ferric oxide, Fe2O3. It is composed of Fe+++ ions and O-- ions. Solid Fe(OH)3 spontaneously loses water to form a material that is in between these extremes, FeO(OH), which is what is often called iron oxide hydroxide, as shown in equations 1-3. Iron oxide hydroxide can be completely amorphous (having randomly arranged ions), completely crystalline (with an ordered arrangement of ions), or something in between. In nature it can take a variety of different crystalline forms, including goethite, lepidocrocite, and limonite. The detailed chemistry of these materials is beyond the scope of this article, but in short, all of the commercial GFO's sold to aquarists are comprised of a solid of Fe+++ and OH- and O-- ions. How crystalline the different commercial products are is unknown to me, although one manufacturer's representative confided in me the belief that the relative crystallinity is an important difference between some of them. Other differences are also important for phosphate binding, and these will be discussed in the following section. Phosphate is believed to bind to iron oxide hydroxide through a direct ionic interaction between one or two negatively charged oxygen ions on the phosphate with the ferric ions (Fe+++) in the solid. Figure 1 shows phosphate in solution above a GFO solid. Figure 2 shows it bound via two ionic bonds, with the displacement of hydroxide. These figures are included so that aquarists can understand what is happening, but are not intended to claim that the surfaces are not also covered with other ions that are known to bind to GFO surfaces, including sulfate, chloride, calcium, magnesium, trace metals, and organics. Figure 1. Phosphate (shown in its most common form in seawater, HPO4--) above a GFO surface. Figure 2. Phosphate displacing hydroxide (OH-) and binding to a GFO surface. Since phosphate binding takes place at the surface of the GFO (and not deep down inside it), the amount of surface area is a very important attribute in determining how much phosphate such a mineral can bind. Even though the commercial materials appear to be reasonably large particles (Salifert claims 0.2 - 2 mm on their product label), they actually have a high internal surface area, somewhat similar to activated carbon. Consequently, particle size is an unreliable means by which to gauge available surface area (though it is reliable for nonporous solids such as table salt). I have not seen any measures of accessible surface area for the commercial GFO sold to aquarists, but one research group1 analyzed its own material and found a surface area of 40-50 m2/g, while another group reported 20 m2/g for a sample of goethite and 250 m2/g for a sample of amorphous iron hydroxide.2 Those values are much lower than activated carbon (typically with hundreds to thousands of m2/g), but much larger than 1 mm cubes of a nonporous solid would provide (0.002 m2/g). For these reasons (crystallinity, extent of hydration with water, and surface area), aquarists cannot simply substitute different commercial brands, or other industrial materials, and expect to attain identical results in aquaria. Interestingly, the concentration of phosphate, in marine sediment pore waters whose sediment is iron oxide hydroxide, appears to be controlled to a great extent by phosphate bound to the iron.3 Even more importantly, this bound phosphate is still available to the water column by exchange, so the sequestering is temporary rather than permanent.3 This fact may be unimportant in an application where the GFO is presented and then removed with its bound phosphate, but in other applications, such as mud substrates or GFO accidentally released into the aquarium, it may become more of an issue. In aquaria, there is no doubt that GFO is effective at rapidly and efficiently reducing orthophosphate concentrations. It may also be at least partially effective at reducing organic phosphate levels, but fewer data are available on such removal since few aquarists measure organic phosphate. Whether the binding of any of these ions is important in aquaria, and whether it should be considered a benefit or a detriment, remains to be established for each trace metal. Nevertheless, it is something that aquarists should keep in mind, and it may also be important in suggesting potential explanations for some of the biological effects of using these materials that are discussed later in this article. The binding of organics, especially those containing phosphorus, is likely to be beneficial in most aquarium circumstances. One possible exception is during treatments of the aquarium with organic medications. How effective this binding is compared to activated carbon, or whether they even bind the same materials, is unknown. It would be expected, however, that certain very polar organic materials might well be bound by GFO, and not by carbon. These would include certain natural biochemicals that might readily provide phosphate to algae, but that are too polar to be absorbed by activated carbon. It should also be noted that GFO would not be expected to be very effective at binding purely hydrophobic molecules that will bind well to activated carbon. Consequently, GFO and carbon are in some ways complimentary in their ability to bind organic materials. If I had to select between the two for removing dissolved organics from aquaria, I'd select activated carbon. Many aquarists using GFO have reported unusually extensive precipitation of carbonates on the solid GFO, and elsewhere in the system. Such precipitation can, for example, be a contributing factor in the caking of such materials, and can coat other surfaces in the aquarium. This precipitation can also contribute to a drop in alkalinity and possibly pH as it removes carbonate from the water column. The effect of calcium will be similar, but smaller on a percentage basis, with a drop of only 20 ppm calcium for every 1 meq/L (2.8 dkH) drop in alkalinity. Increased calcification by corals and coralline algae (possibly spurred by reduced phosphate) can also cause similar drops in calcium, alkalinity, and pH. Dissolution of these precipitates with acid, accompanied by bubbling, indicates that these deposits are carbonates, and are most likely calcium carbonate since it is supersaturated in most reef aquaria (and in the ocean). Several factors may contribute to this precipitation. Many of these are rather straightforward. It is known, for example, that phosphate inhibits the precipitation of calcium carbonate. Much like the role that magnesium plays in seawater, phosphate binds to the growing calcium carbonate crystals, poisoning their surface against further precipitation of calcium carbonate. Many organic materials are also known to inhibit this precipitation. Near the surface of the GFO, and downstream from it, the organics and phosphate are expected to be lower in concentration than upstream from it. The reduction in concentration of these inhibitors may well permit increased abiotic precipitation of calcium carbonate on such surfaces. Two more esoteric events may, however, be equally important. The first is that the local pH near the GFO surfaces may be higher than in the bulk solution. This effect arises as phosphate and other inorganic and organic ions displace hydroxide from the surface. Figure 2, for example, shows phosphate displacing two hydroxide ions. The net swap of HPO4-- for 2 OH- will raise the local pH. The supersaturation of calcium carbonate increases as the pH rises, driving the precipitation of calcium carbonate. Another possible role may be played by the iron itself. GFO is not completely insoluble. The solubility of iron hydroxide in natural seawater is small, but still significant (0.02 - 2 ppb), although it is largely controlled by the availability of organic ligands.11-13 One interesting possibility lies in the way that soluble iron actually impacts the precipitation of calcium carbonate. At high concentrations, iron inhibits the precipitation of calcium carbonate. While different researchers find different threshold concentrations for this inhibition (>25 ppm in one case,14>7ppm in another case15), it is a well established and studied phenomenon. The mechanism is believed to be the same as for magnesium, phosphate, and organics, which all poison the growing calcium carbonate surface. At much lower concentrations, however, iron actually increases the precipitation of calcium carbonate by acting as a site for nucleation of new crystals. In one case this happened at 100 ppb dissolved iron, increasing the rate of scaling (the precipitation of calcium carbonate on surfaces) by about 60%.14 In another case, the induction time for precipitation (that is, the time it takes for precipitation to begin once the water becomes supersaturated) was reduced by 40% at 1.4 ppm iron and the overall precipitation rate was increased by 32% at 560 ppb (lower iron levels were not tested).15 These studies were carried out in freshwater, and I have not seen similar studies in seawater. Is the natural dissolution of GFO important in the nucleation of calcium carbonate precipitation? I am not sure. But it is clearly one possible explanation that fits the observations of aquarists as well as known phenomena involving iron. A sudden drop in phosphate may stress certain organisms. This stress might be particularly important to corals with algal symbionts. The level of symbionts existing in a coral may depend to some extent on the availability of nutrients. A sudden drop in nutrients may imbalance the organism, leaving it with too many zooxanthellae for the newly-reduced nutrient levels. Especially if these corals are already living on the edge of survival, such stress may tip the balance toward disease. In some cases, phosphate levels may drop below natural seawater levels, and phosphate may become the limiting nutrient. If this limitation is severe enough, corals and other organisms using phosphate may well be stressed, stop growing, and become more susceptible to disease. Similar effects may result from a drop in certain trace metals. Since the effects of GFO on trace elements have not been clearly established in aquaria, it is possible that one or more critical elements may drop below optimal levels. The release of soluble iron hydroxide itself may irritate certain corals, although many aquarists dose chelated iron without such effects. The iron hydroxide may, however, nucleate the precipitation of calcium carbonate in sub-optimal places, such as tissue surfaces. It may also bind directly to tissues. The GFO may actually release certain metals other than iron from its surface. I have not seen any data on the chemical purity of these materials, and such issues may be a concern with some or all brands. The drop in alkalinity and/or pH caused by abiotic precipitation of calcium carbonate would not be expected to be very great in most aquaria, and typically isn't especially large, as reported by the aquarists themselves. In the cases from which I've seen data, the effect is not as great as the variability between aquaria or between dosing events in many aquaria. Still, such changes might be important in some circumstances where conditions are already marginal. Since GFO binds organic materials, the addition of a significant amount of fresh surface area may rapidly drop the dissolved organic levels. Such a drop may stress corals by rapidly increasing the available light levels, or by reducing a food source, or both.In order to minimize such difficulties, many aquarists start off using GFO more slowly than the directions might suggest. Such caution seems warranted in most cases. In order to minimize such difficulties, many aquarists start off using GFO more slowly than the directions might suggest. Such caution seems warranted in most cases. Figure 3. 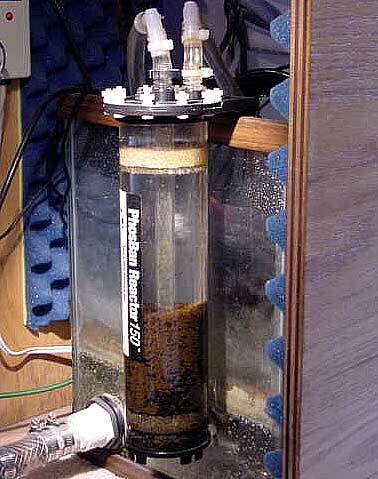 GFO in use in a fluidized bed reactor hanging on the sump. Photo courtesy of Skip Attix. I have only recently tried in my aquarium any of the commercial GFO brands sold to aquarists (I used Salifert's Phosphate Killer), and it is too soon to comment on that test. I have not yet, however, noticed any problems. There are obvious differences between them, including the amount of water they contain. Rowaphos, for example, comes as a wet solid while Salifert's product, Phosphate Killer, comes as an apparently dry solid. Other differences could include the surface area, any surface chemical treatments, the amount of fine particles present, and other factors. For these reasons, I should stress not to assume that they are all the same. I am not prepared, however, to make any claims about the relative efficacy of the various brands. Some published experiments do purport to examine the relative effectiveness of different brands. In one such study, the phosphate binding data were largely generated at phosphate levels above the range likely to be encountered by most reef aquarists (0.5 - 3.5 ppm), while at normal aquarium phosphate concentrations (up to about 0.2 ppm), the two products appeared equivalent. In a second study, two products being compared were dosed at such high levels that both products bound nearly all of the available phosphate (down to 0.01 ppm). Such a test is akin to comparing the pain reducing efficacy of morphine and aspirin by showing that both relieved a headache. A possibly better test would involve dosing less and seeing which brand (if either) reduces phosphate the most. Aquarists who choose to use such materials should be aware of the possible biological problems that other aquarists have encountered. Starting slowly and allowing the phosphate to decline over a period of a week or two may be less stressful than dropping it in a period of hours, regardless of the mechanism of the problems encountered. Using a smaller amount of material, and changing it more frequently, may also be less stressful. Salifert recommends using 250 mL (8.5 ounces) of its product (Phosphate Killer) to treat a 125-250 gallon tank for up to three months. There is, however, nothing wrong with starting with 1/10 that amount to see what happens. While it may be more work, using one ounce and changing it after two weeks may reduce some of the issues that aquarists have observed when changing the media. Aquarists should also be aware that dropping phosphate to extremely low (i.e., growth limiting) levels may cause undesirable effects that reef aquarists do not typically encounter without using such materials. It is quite possible that if GFO can bind enough phosphate to limit the growth of algae, it may be possible to bind enough phosphate to limit the growth of other organisms, such as corals. I'd suggest using a phosphate test kit as a guide to how much material to use (i.e., use more if you maintain levels above 0.02-0.03 ppm, and perhaps use less if you never detect any phosphate). Kits can also be used to determine when to change the GFO (change it if phosphate levels begin to rise after a period of being lower). Finally, be sure to rinse these materials in fresh or salt water before adding them to the aquarium as fine particles may get loose in the aquarium, clouding and coloring the water, and possibly creating other problems. There is no efficiency drawback to this rinsing. Aquarists using the GFO in a fluidized bed reactor or canister filter should just run some water change water on it for a few minutes before putting it into the tank. 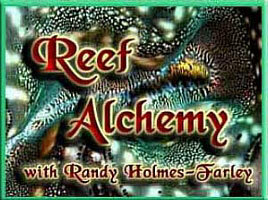 A media bag of GFO can simply be rinsed with salt or RO/DI water a few times before adding it to the aquarium. Do not squeeze the GFO inside of the bag when rinsing as that may break the particles into smaller bits that can then escape the bag. The bottom line: Would I use GFO to export phosphate? The answer is a qualified yes. Phosphate is such a significant problem for reef aquaria that it should be kept appropriately low (less than 0.03 ppm) in some fashion. There are many ways to minimize the accumulation of phosphate. In my own reef, I prefer to use skimming, carbon, and macroalgae growth to export phosphorus. If these are unsuited to a particular setting, then perhaps GFO is an appropriate alternative. 1. Synthesis and characterization of goethite and goethite-hematite composite: experimental study and literature survey. Kosmulski, Marek; Maczka, Edward; Jartych, Elzbieta; Rosenholm, Jarl. B. Department of Electrochemistry, Technical University of Lublin, Lublin, Pol. Advances in Colloid and Interface Science (2003), 103(1), 57-76. 2. Selenate and selenite sorption on iron oxides: an infrared and electrophoretic study. Su, Chunming; Suarez, Donald L. R.S. Kerr Environmental Research Center, ManTech Environmental Research Services Corp., Ada, OK, USA. Soil Science Society of America Journal (2000), 64(1), 101-111. 3. Phosphorus phases in the surface sediment of the South Sea. Son, Jaekyung; Lee, Tongsup; Yang, Han Soeb. Dep. Marine Science, Pusan National Univ., Pusan, S. Korea. Han'guk Susan Hakhoechi (1999), 32(5), 680-687. 4. Adsorption of cations on hydrous oxides of iron. II. Adsorption of Mn, Co, Ni, and Zn onto amorphous FeOOH from simple electrolyte solutions as well as from a complex electrolyte solution resembling seawater in major ion content. Kanungo, Sukriti B. Reg. Res. Lab., Bhubaneswar, India. Journal of Colloid and Interface Science (1994), 162(1), 93-102. 5. Adsorption of cations on hydrous oxides of iron. III. Adsorption of Mn, Co, Ni, and Zn of bFeOOH from simple electrolyte solutions as well as from a complex electrolyte solution resembling seawater in major ion content. Kanungo, Sukriti B. Reg. Res. Lab., Bhubaneswar, India. Journal of Colloid and Interface Science (1994), 162(1), 103-9. 6. The regulation of trace element concentrations in river and estuarine waters contaminated with acid mine drainage: The adsorption of copper and zinc on amorphous iron oxyhydroxides. Johnson, Carola Annette. R. Sch. Mines, Imp. Coll., London, UK. Geochimica et Cosmochimica Acta (1986), 50(11), 2433-8. 7. Effect of phosphate enrichment on the metal adsorption properties of hydrous iron oxide. Haq, Ikram Ul; Akhtar, Khalida; Iqbal, Kausar; Arshia, S. F. National Centre of Excellence in Physical Chemistry, University of Peshawar, Peshawar, Pak. Journal of the Chemical Society of Pakistan (1998), 20(2), 99-109. 8. 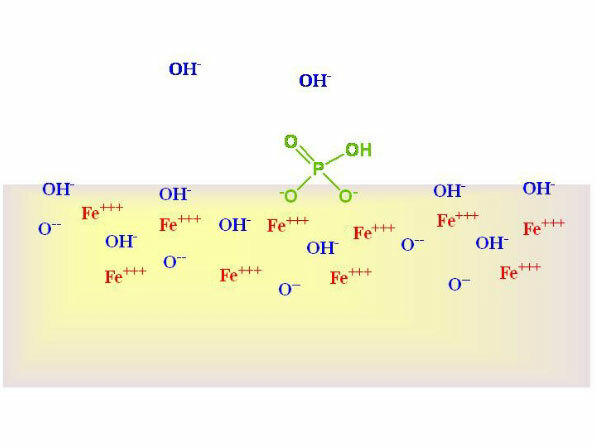 Molecular mechanism of surface recognition during the adsorption/degradation of organic compounds on iron oxides. Bandara, J.; Mielzcarski, J.; Kiwi, J. Institute of Fundamental Studies, Kandy, Sri Lanka. Studies in Surface Science and Catalysis (2000), 130C(International Congress on Catalysis, 2000, Pt. C), 2177-2182. 9. 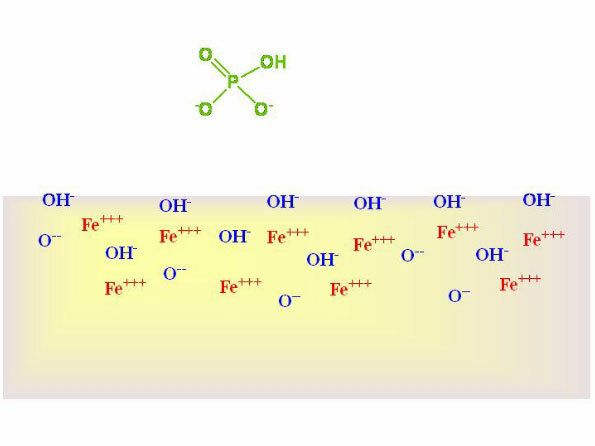 Adsorption of humic substances onto ss-FeOOH and its chemical regeneration. Teermann, I. P.; Jekel, M. R. Department of Water Quality Control, Technical University Berlin, Berlin, Germany. Water Science and Technology (1999), 40(9), 199-206. 10. Techniques for extraction of dissolved inorganic and organic phosphorus from large volumes of sea water. Lee, T.; Barg, E.; Lal, D. Scripps Inst. Oceanogr., La Jolla, CA, USA. Analytica Chimica Acta (1992), 260(1), 113-21. 11. Iron(III) hydroxide solubility and humic-type fluorescent organic matter in the deep water column of the Okhotsk Sea and the northwestern North Pacific Ocean. Tani, Heihachiro; Nishioka, Jun; Kuma, Kenshi; Takata, Hyoe; Yamashita, Youhei; Tanoue, Eiichiro; Midorikawa, Takashi. Graduate School of Fisheries Sciences, Hokkaido University, Hakodate, Hokkaido, Japan. Deep-Sea Research, Part I: Oceanographic Research Papers (2003), 50(9), 1063-1078. 12. Vertical distributions of iron(III) hydroxide solubility and dissolved iron in the Northwestern North Pacific Ocean. Nakabayashi, Shigeto; Kusakabe, Masashi; Kuma, Kenshi; Kudo, Isao. Ocean Research Department, Japan Marine Science and Technology Center, Yokosuka, Japan. Geophysical Research Letters (2001), 28(24), 4611-4614. 13. Spatial variability of Fe(III) hydroxide solubility in the water column of the northern North Pacific Ocean. Kuma, Kenshi; Katsumoto, Akira; Kawakami, Hajime; Takatori, Fumiaki; Matsunaga, Katsuhiko. Department of Fisheries Oceanography and Marine Science, Faculty of Fisheries, Hokkaido University, Hakodate, Japan. Deep-Sea Research, Part I: Oceanographic Research Papers (1998), 45(1), 91-113. 14. Calcium carbonate scale control, effect of material and inhibitors. Macadam, J.; Parsons, S. A. School of Water Sciences, Cranfield University, Cranfield, UK. Water Science and Technology (2004), 49(2), 153-159. 15. Experimental study of the influence of some divalent and trivalent metal cations on nucleation and growth of CaCO3. Zeppenfeld, Kai. Werne, Germany. Chemie der Erde (2003), 63(3), 264-280. 16. Aggregation-based crystal growth and microstructure development in natural iron oxyhydroxide biomineralization products. Banfield, Jillian F.; Welch, Susan A.; Zhang, Hengzhong; Ebert, Tamara Thomsen; Penn, R. Lee. Department of Geology and Geophysics, University of Wisconsin-Madison, Madison, WI, USA. Science (Washington, D. C.) (2000), 289(5480), 751-754.